Weird But True Know-It-All: U.S. Presidents by Brianna DuMont from National Geographic Kids is probably best suited to ages 8-12 and contains numerous weird facts about our nation’s presidents. In addition to facts about the presidents, there are some fun facts about the White House, including information about what renovations were made by several presidents — one of the first being an indoor bathroom. The White House also has a chocolate shop, a florist shop, and a dentist within its walls, and the fact that the White House was built on a swamp is actually a myth. There’s a list of powers for each branch of government, but lest you think this book is boring, you just have to keep reading on. Thomas Jefferson, for example, organized a contest to design the White House, and historians secretly think he entered and lost the competition. James Monroe, our 5th president, once defended himself in an argument with his treasury secretary with a pair of fire tongs — talk about a heated argument. Another interesting tidbit is that Andrew Jackson, our 7th president, fought more than 100 duels in his lifetime. That’s a lot of disagreements. And you can thank William Howard Taft, the 27th president, for that tradition of the president throwing out the first pitch in baseball. One of my favorites, John F. Kennedy, apparently penned his own spy thriller and talked about how to deal with Cuba with Ian Fleming — yes, that Fleming. 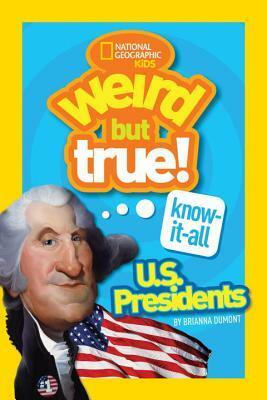 Weird But True Know-It-All: U.S. Presidents by Brianna DuMont is really enjoyable for younger readers and adults. I think it would be a great book to take on a trip and quiz each other about presidential facts. Pick up a copy and start having fun on your next road trip.